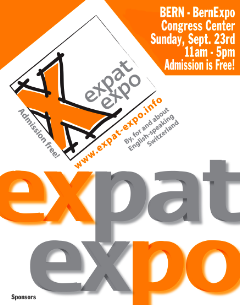 If you live in the capital of Switzerland or somewhere in the middle of this gorgeous country, you don't want to miss the Bern Expat-Expo on Sunday, September 23rd, 2012 from 11:00AM- 5:00 PM at the BERNEXPO Congress Centre, Mingerstrasse 6, 3014 Bern. DA Switzerland will have a table there to greet attendees and provide information on the group's activities and sell campaign swag. We will also have trained VoteFromAbroad volunteers ready to help you registration to vote (non-partisan, of course)! Admission is FREE. 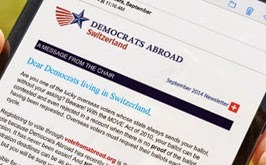 Make sure you are registered to vote for the 2012 November elections and that you receive an absentee ballot by mail in Switzerland or by email (new as of this year)! Go to http://www.VoteFromAbroad.org and fill follow the process, print out the form, sign and date it, and mail it to the address provided. Questions? Bring the completed form with you to the Expat Expo fair and we'll review it with you so you are sure you got it right before putting it in the mail. Don't delay! Deadlines for many states are already early October!